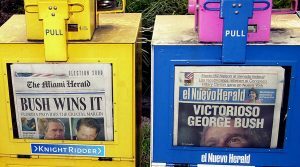 In the first full study of Florida’s ballots since the election ended, The Miami Herald and USA Today reported George W. Bush would have widened his 537-vote victory to a 1,665-vote margin if the recount ordered by the Florida Supreme Court would have been allowed to continue, using standards that would have allowed even faintly dimpled “undervotes” — ballots the voter has noticeably indented but had not punched all the way through — to be counted. The study, conducted by the accounting firm of BDO Seidman, counted over 60,000 votes in Florida’s 67 counties, tabulating separate vote totals in several standards categories. While the USA Today report focused on what would have happened had the Florida Supreme Court-ordered recount not been halted by the U.S. Supreme Court, the Herald pointed to one scenario under which Gore could have scored a narrow victory — a fresh recount in all counties using the most generous standards. In their reports, the newspapers assumed counts already completed when the court-ordered recount was stopped would have been included in any official count. Thus, they allowed numbers from seven counties — Palm Beach, Volusia, Broward, Hamilton, Manatee, Escambia and Madison — to stand, but applied the most inclusive standards to votes in the rest of the state. If those numbers did not stand, the Herald reported, a more generous hypothetical revisited recount would have scored the White House for Gore — but with only a 393-vote margin. Under most other scenarios, the papers reported, Bush would have retained his lead. The newspapers’ review did not include the approximately 110,000 “overvotes” — ballots cast for more than one candidate. Both papers are planning a separate analysis of overvote numbers next month. Neither President Bush nor former Vice President Gore have thus far commented on the recount’s results. But according to White House spokesman Ari Fleischer, Mr. Bush has put the close election behind him. But former Gore campaign spokesman Doug Hattaway, now working as a Democratic consultant in Boston, said Mr. Gore would have captured the White House had voters’ true intentions been determined. In all, the newspapers’ recount cost more than $500,000 and employed 27 accountants. Another recount of all Florida votes — including both under- and overvotes — is still in the works under the eye of a consortium of media organizations, including The Associated Press, The New York Times, The Washington Post, The Wall Street Journal and CNN. That review, conducted by the Chicago-based National Opinion Research Center, is due out next month.